About a year ago, if someone were to ask me about Essie polishes, I would have made an expression of disgust. A couple of years ago, I had tried three Essie polishes and hated them in every way possible (i.e, sheer color, gooey or runny formula, and expensive). Early this past Spring, I rediscovered Essie and since then have purchased quite a few Essie polishes. Now, I would definitely recommend the brand to beauty and makeup newcomers, but with a caveat - do check the formula and application of the polish prior to purchasing the polish and wait for a promotion or sale. How do I try the formula and application prior to purchasing the nail polish? Ask the beauty department employee or store manager for permission to swatch the polish. Typically, the employee will provide you with a piece of tape or a blank receipt. Do NOT test the polish on your own nails or the shelf that the polishes are stacked on. Most often the beauty department employees will scold you. Although I respect that they want to maintain the integrity of selling new and sanitary products to customers, I wish stores would keep a tester bottle for expensive polishes. I definitely do not want to purchase a bottle that has been opened and tried by several people because more air enters the bottle and bacteria. The process of returning is such a hassle even if returns are accepted for beauty products. I would recommend tape more than a piece of paper. You can stick the tape on your arm or hand and determine if the color suits your skin tone. You may want to bring your own tape from home. 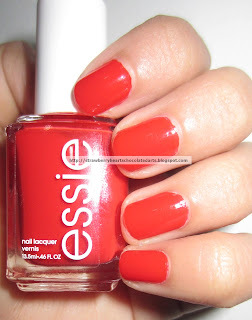 Where can I purchase discounted Essie polishes? I have purchased discounted Essie polishes at Kohl's and Bed, Bath, & Beyond (with a beauty department). Not all BBB have a beauty department, so you may want to call you local BBB first to inquire if they have a beauty department. Most BBB do not. I was fortunate enough to find one with a beauty department in the city where I have been interning in the summers. I have noted that all Kohl's stores that I have been to carry Essie polishes. Kohl's even receives shipment of new and seasonal collections. The polishes retail at $7.79 at Kohl's and BBB. At Kohl's, I purchase Essie when I receive a 30% off coupon, which is the highest % off coupon they send out to their customers. I believe that these promotions are also usable for online purchases. I have the option of using a 20% off entire purchase or $5 off $15 or more at BBB. I purchased two polishes from BBB, which came to a little more than $15 with tax, and ultimately paid about $11 for two after using $5 off coupon. So, at both Kohl's and BBB, I paid about $5 and some change for an Essie polish, which is better than the original retail price range of $7.79 to $8.50. Nowadays, drug-store brand polishes cost between $4 - $6, so getting a salon brand for as much seems like a nice deal. Essie polishes are not high-end like MAC, YSL, or CHANEL, but I would not place them in the affordable drug-store category. I categorize them as a pro/salon brand, not sure if that is accurate on my part. I know that salon professionals with a cosmetology license and salons receive discounts on their orders of Essie, OPI, and ZOYA polishes from salon professional exclusive stores, such as Planet Cosmo or Salon Centric. China Glaze and Orly are still somewhat more affordable. As of late, ULTA no longer accepts store coupons for OPI because it is now considered a high-end brand. Essie polishes retail for $8.00 at ULTA. Look out for a $2.00 off Essie coupon at select participating stores like Target, Rite Aid, and ULTA. ULTA sometimes has buy two get one free or buy one get one 50% off or buy two at x amount promotions on OPI, ORLY, China Glaze, and Essie polishes. Phew! Enough talk about coupons and promotions. 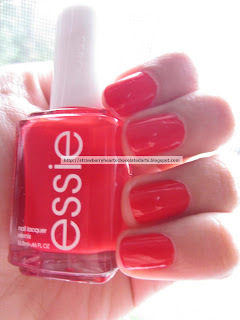 Now, let us move on to the Essie polishes below for a review and lots of pictures. I am under the impression that "No More Film" is a new addition to the permanent Essie nail lacquer collection. I don't think this shade was released as part of a Summer 2013 or seasonal collection, but I could be wrong. I love this color! I think the pictures below really capture the beauty of this sapphire blue shade. Although I have added Essie's Good to Go top coat, this polish has a shiny finish independent of the top coat. It is a creme formula with subtle shine (not shimmer). It is the first dark navy blue shade that has not made my hands look stark or dull. This shade looks beautiful in all types of lighting - indoor, outdoor, white light, or yellow light. It reminds me of Revlon Urban nail polish, but it is not the same. It is better! Even if you own Revlon's Urban, I would still recommend trying Essie's No More Film. Essie's No More Film is a dark shade, but it is not as dark as Revlon's Urban, which looks more vampy that this one. 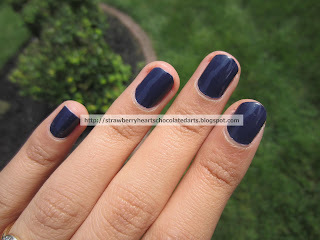 Essie's No More Film has indigo undertones. It looks like a shiny sapphire gemstone. This polish requires only one coat. I am wearing two coats in the following pictures. The application was clean and effortless. Of course the polish is not sheer and runny or thick and gooey, but you have to be a little careful because of the top of the applicator drips and can accidentally spill on your hands or clothes. I don't think that this is an issue with the formula of the polish, but rather with the applicator because I have been experiencing this problem with a lot of other polishes. This is a gorgeous deep orange shade with strong red undertones. Essie's Geranium has a jelly-like formula. 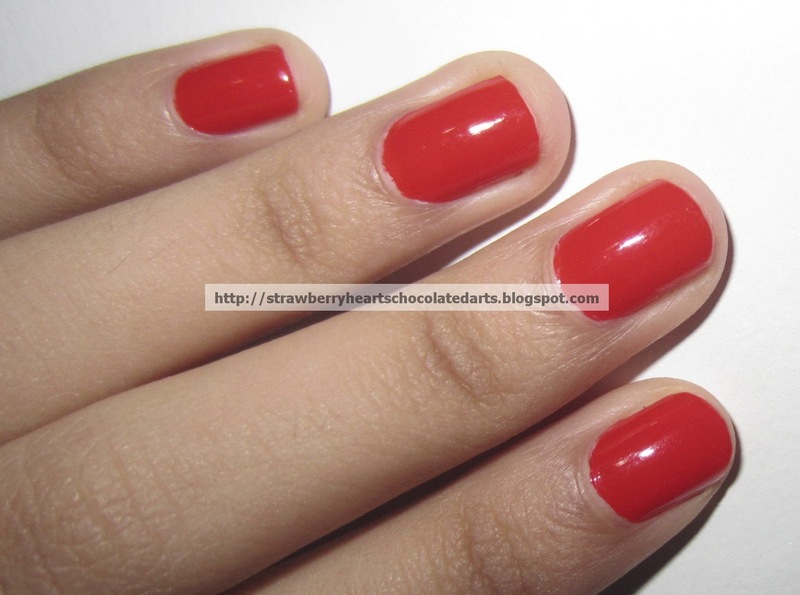 The first coat adds a sheer reddish orange color to your nails. Once you apply a second or third coat, you are able to attain full opacity as I have demonstrated in the pictures below. This is not one of those frustrating sheer polishes, which requires you to continue adding coats to receive an opaque, bubble-less, patch-less, streak-less application. Honestly, I like polishes that are good to go in two coats, dry quickly, and look and feel lightweight. I don't like polishes, which require so many coats that the polish makes my nails appear raised, creating a thick unnatural looking layer on top of my nails. The jelly formula makes this polish sheer and lightweight, but not so sheer that you need five or more coats for it to show up and still not look nice. I love this color! I don't know what took me so long to discover this particular shade. 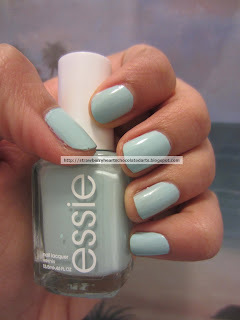 I know Essie's Mint Candy Apple is a cult favorite, but I was apprehensive to try to because of my general dislike for the brand. 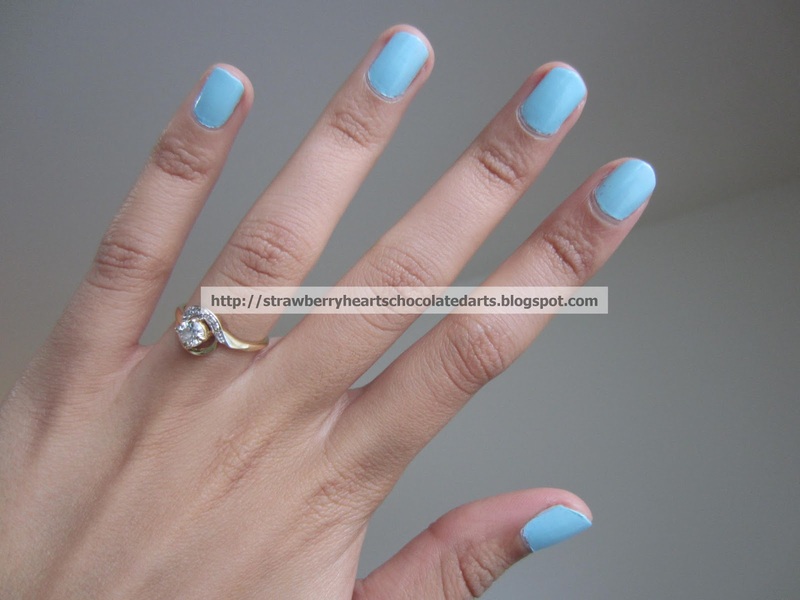 A pastel, blue-toned, light foamy mint green. I am not a big fan of green, so I like that this looks like a milky pastel baby blue with sea-foam or sea-green or mint-green mixed into it. The first coat might look a little streaky, but looks flawless by the second coat. I'm wearing Essie's Good to Go top coat on top. I can say with confidence that I would be content with this nail polish if someone were to take my nail polish collection away from me. I hope that day never arrives as I treasure my beauty and jewelry collection as if the items were my babies. I store and organic my things with a lot of care and thought, so fingers crossed please refrain from high-jacking of my nail polish collection. Of course my friends think I am a little, "uh what's the word," as I own maybe five mint polishes. I say, "there is a difference, one for each fingernail! 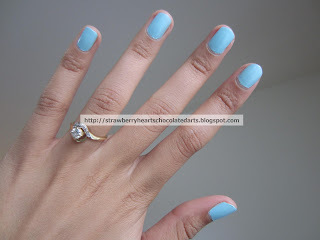 "The fact that I have taken a lot of pictures of this shade demonstrates my love of it. Sadly, Essie's Fiji was a disappointment. It reminded me of why I have always disliked Essie polishes in the past. 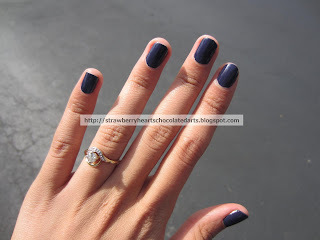 I had to wear five coats of this polish to achieve the look in the pictures below. I still don't feel like it looked nice. My nails looked raised as if I had a little hill on each one of them. Little pockets where I could see my nails peeping through were still visible if you looked closely. 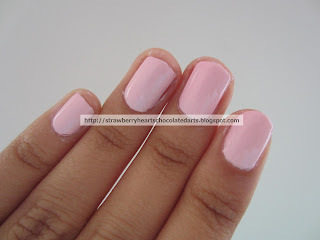 A soft milky baby pink, but tough application. I cannot seem to find a true milky baby pink that applies like a dream or one that does not look neon or stark against my skin. I hope this post was helpful. 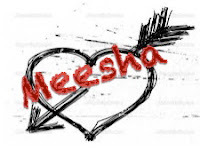 I apologize for the lengthy introduction, but hopeful it was informative. I refrained from commenting on the wear time (longevity) of the lacquers because I only wear a particular polish for four full days and then I like to keep my nails bare for a while. In the four days, I only experience minor chipping on my index fingers and that is all.